Photographed at Sego Safari Lodge, upper Kerio Valley, Elgeyo-Marakwet, Kenya, Africa. Dec. 2014. Notice the red feet and yellow-feathered legs. Feeding on fruit of Desert Date (Balanites aegyptiaca). 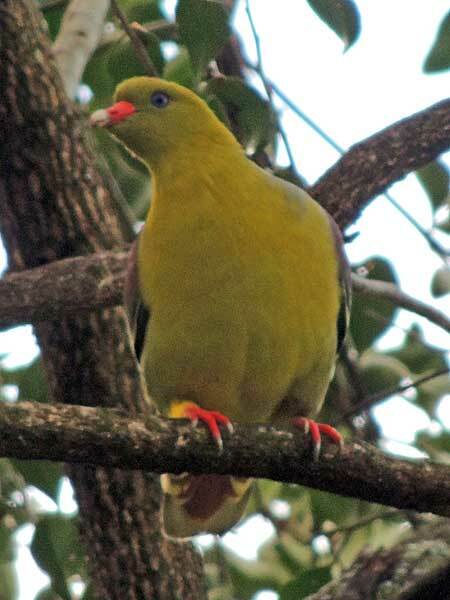 From Wikipedia: African Green Pigeons frequent tree canopies where their parrot-like climbing ability enable them to reach fruit, but rarely also forage on the ground. The species has a wide range in Sub-Saharan Africa. In Kenya deforestation has reduced the areas where this bird is likely to be seen; it is more common in western Kenyan forests. Adult birds have maroon shoulder patches (olive in immatures) and rufous undertail coverts. They reach a length of 25–28 cm. Their call is a series of flowing whistles, rendered as ‘thweeeloo, thweeeoo’. They inhabit riparian forest, woodland and savanna, where they associate with fruiting trees, especially wild fig (Ficus) species, including Ficus sycomorus and Ficus sur, and in cities the ornamental Chinese banyan. They also feed on exotic Loquats and Mulberries, or on carrion by occasion.